Is it morally acceptable to teach something that is false if it helps children believe in a religion? The current Primary Manual has the following story. 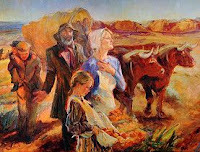 "A group of Latter-day Saint pioneers, led by Brigham Young, were near the Rocky Mountains. One night they camped in a small valley. After supper they built a big bonfire. They sang and danced around the bonfire to help them forget their fears and worries. Before they went to bed in their wagons, leaving a single guard on duty, they sang “Come, Come, Ye Saints,” a song they used to encourage each other and show their dedication to the Lord. That night there were a thousand unfriendly Indians hiding around the camp, ready to attack the pioneers. But after the Indians heard the pioneers sing “Come, Come, Ye Saints,” they were unable to attack. They knew the Great Spirit (their name for Heavenly Father) was watching over the pioneers, so they got on their horses and rode away, leaving the pioneers alone. The Manual quotes a story from the Children's Friend 1965. The Children's Friend version of the story quotes a 1958 book called A Century of Singing. Which is about the Mormon Tabernacle Choir. The book version of the story adds two more layers of sources. It says that the story was told to four missionaries told the son of the Chief of the 1000 Indian Braves. See other versions of story below. #1 - There is no evidence that the 1847 / 48 Mormon Pioneers sang, "Come, Come Ye Saints". #2 - 1000 Young braves with 1000 horses would take up 1.7 miles if standing only 2 feet apart. (Horse 3 feet wide, man 2 feet wide, plus 4 feet between times 1000) = 9000 feet - 2 feet = 8998 feet = 1.7 miles. #3 - The 1000 Indians managed to come into the valley, hide behind rocks and trees and then leave without being noticed by the Mormons. #4 - The chief was able to give a signal in the dark that 1000 Indians could perceive but the Mormons did not. #5 - In one version of the story, the teller also plays the tune on the violin. #7 - Why would mid 19th century Indians claim a song in English about pioneers as their song? #8 - Does this feel a bit too much like the story of the 2000 Lamanite Warriors from the Book of Mormon? #9 - How many Indian Villages in 1840's Wyoming would it take to recruit 1000 YOUNG Braves? #10 - There are no stories from Mormon History, Oregon Trail History or California Gold Rush History where a party of 1000 Warriors attacked a wagon train. They just didn't travel in groups that big. 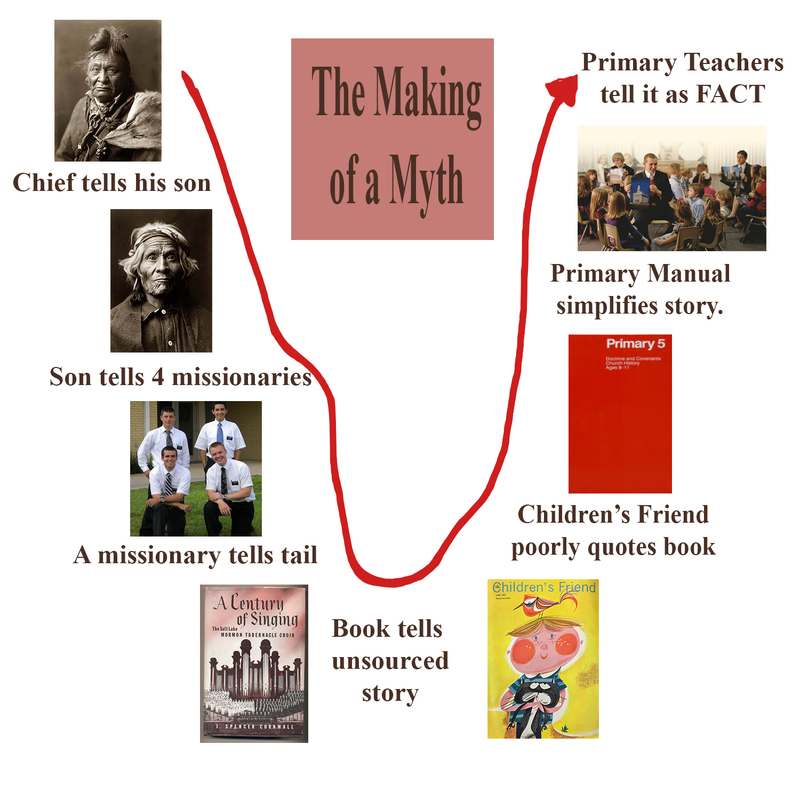 #1 - Why does the LDS Church teach its children a 4th or 5th hand story as fact, but reject nearly every other source of history outside its own correlated material? #2 - Is it OK to teach a story that is false if it makes children believe in the message? #3 - Would it be OK for the missionaries to teach the First Vision or Book of Mormon stories to millions if they are also false, if they help people believe the message? # 4 - Is this story racist? Does it create a stereotype of blood thirsty 19th century Native Americans? It is NOT morally acceptable to teach something False, while presenting it as fact. Many, many moons ago my people were on the warpath. We hated the palefaces. We held council and decided to kill everyone. A band of palefaces were going west. They had almost reached the Rocky Mountains. I was the chief of 1,000 young braves. That night silently we waited on a mountain pass for these people, which were led by Brigham Young. There were braves with bows and arrows behind every rock and tree, waiting to pounce down upon the palefaces. The pioneers camped for the night and prepared dinner. The big bonfire was burning brightly, and the palefaces danced around the fire. Everyone then sat down and began singing, "Come, Come, Ye Saints." I gave the signal, but our fingers were like stone—not one arrow was shot. We mounted our horses and rode back to camp. We knew the Great Spirit was watching over the palefaces. This is your song; it was your forefathers' song and is my song every night before I go to bed. It brings the Great Spirit near to me and makes me and my people happy.